Sophomore Kenny Pickett will enter this season as starting quarterback at Saturday’s opener against Albany. The Pitt football season kicks off this Saturday afternoon at Heinz Field as the Panthers face off against a less-feared member of both the college football universe and animal kingdom — the Albany Great Danes. The Panthers will start the season like they have for each of head coach Pat Narduzzi’s four years at the helm — with a home match against a Football Championship Subdivision opponent. Both Football Bowl Subdivision and FCS teams are considered Division I, but the two differ in that the FBS uses a bowl system and the FCS a more traditional playoff setup, while the level of play is also considered superior in the FBS. As an FBS school, Pitt will use this Albany game as preparation for the season ahead — in particular the highly anticipated clash with Penn State the following week. While it would seem typical for the Panthers to run up the score for an easy win against an FCS team like the Great Danes, they’ve had trouble taking care of weaker squads in recent years, especially under Narduzzi. In the past two openers against FCS Youngstown State, Pitt escaped with a 45-37 win in the first meeting, then blew a 21-0 lead last year before winning 28-21 in overtime. Narduzzi has defended these seemingly underachieving performances by saying the Panthers avoid showing off most of their playbook so that it can’t be used to their disadvantage. This has been the case in the last two years, as Pitt prepared to go up against Penn State right after. Albany could potentially cause Pitt trouble like Youngstown State has done in the past, but it would be a surprise, considering the Great Danes are coming off a lackluster 4-7 season. One player who could give the Panthers trouble is redshirt junior running back Elijah Ibitokun-Hanks. Ibitokun-Hanks was a star for the Great Danes in 2016. He ran for 1,401 yards — first in the CAA conference and fourth in the FCS — and 16 rushing touchdowns. Although he only played one game last year due to a knee injury, fans can expect Ibitokun-Hanks to be a nuisance for the Pitt defense come Saturday. Another crucial factor of Albany’s game plan revolves around its quarterback — whose name you might recognize. Senior Vincent Testaverde, the son of the former Heisman and NFL quarterback Vinny Testaverde, will be under center for the Great Danes this season. He won a three-way battle to secure the spot, meaning that he will finally get sufficient playing time in his fifth year of eligibility after failing to break through at Miami or Texas Tech. 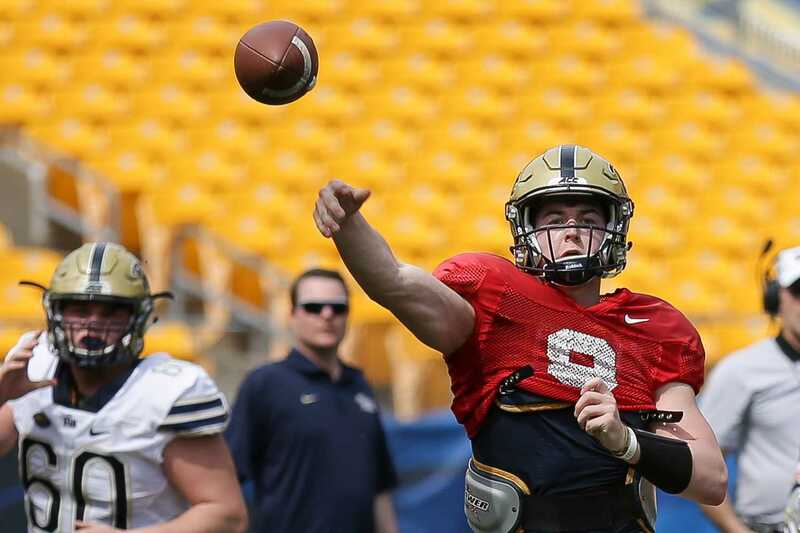 Despite the unimpressive performances that Pitt has exhibited recently against FCS opponents, they remain the clear favorite in this game. While the Panthers are coming off a disappointing 5-7 season and missed a bowl game for the first time in a decade, they finished strong with an upset of undefeated No. 2 Miami. Then-first-year quarterback Kenny Pickett was the star of the show in that Miami game, throwing for 193 yards and rushing for 60, totaling three touchdowns in the win. Now the bona fide starter, Pickett will get the chance to show that game was no fluke. Aiding him on the ground will be senior running backs Qadree Ollison and Darrin Hall. Both Ollison and Hall fought back and forth for the starting position last year, and will likely continue to do so against Albany and throughout this season. Pitt’s main weaknesses on offense will be the lack of experience on the offensive line and at wide receiver. The loss of first team All-ACC offensive tackle Brian O’Neill and second team All-ACC kickoff returner Quadree Henderson to the draft, as well as leading receiver Jester Weah and offensive guard Alex Officer to graduation, leaves both units in need of players to step up. Pickett will look to wide receivers like junior Aaron Mathews, senior Rafael Araujo-Lopes and redshirt junior Tre Tipton to make up for the losses of Weah and Henderson. On the offensive line, 2017 All-ACC honorable mention senior offensive tackle Alex Bookser will lead the unit, along with redshirt senior guards Connor Dintino and Mike Herndon. Pitt will most likely win this game on the defensive side of the ball. The defense returns nine starters from a year ago and should perform at a high level — similar to when they held Miami to just 14 points and 232 total yards in last year’s finale — more consistently this season. While the loss of defensive backs Jordan Whitehead and Avonte Maddox to the NFL draft hurts the team, the Panthers have players ready to take their place. Defensive backs including junior Damar Hamlin, sophomore Damarri Mathis and redshirt freshman Paris Ford will look to prove themselves against the Great Danes. Expect redshirt senior defensive back Dennis Briggs to be the leader of this young secondary. The Pitt defense will want to hit Albany at their offensive line. The Great Danes’ offensive line produced the least rushing yardage and gave up the second-most sacks in the CAA last season. The Panthers should exploit this weakness with a defensive line that includes fifth-year players James Folston, Shane Roy and Dewayne Hendrix, as well as promising young players like redshirt sophomores Keyshon Camp and Rashad Weaver, who led the line in tackles, tackles for loss and sacks in 2017. The linebacking corps of redshirt seniors Elijah Zeise, Quintin Wirginis and Oluwaseun Idowu, along with redshirt junior linebacker Saleem Brightwell, should also play a large part in the Panthers’ experienced defense against Albany. Idowu, the former walk-on, was especially exceptional last year as he lead the team in tackles, tackles for loss and sacks on his way to a second team All-ACC selection. If the Panthers can hold Ibitokun-Hanks to minimal production on the ground and stop Testaverde from exposing them in the passing game, they should easily win this game. Narduzzi also said, unlike previous years in which he held back his playbook before Penn State, his team won’t be hiding anything against Albany. This will allow Pitt to expand its offense and dominate its opponent with no restrictions.